Guinea pigs are generally as clean as you keep them, so if yours has an odor, it means you need to change your care routine, or he's sick. As caged rodents, guinea pigs have no choice but to live in their own food and filth, but that doesn't make them pigs. 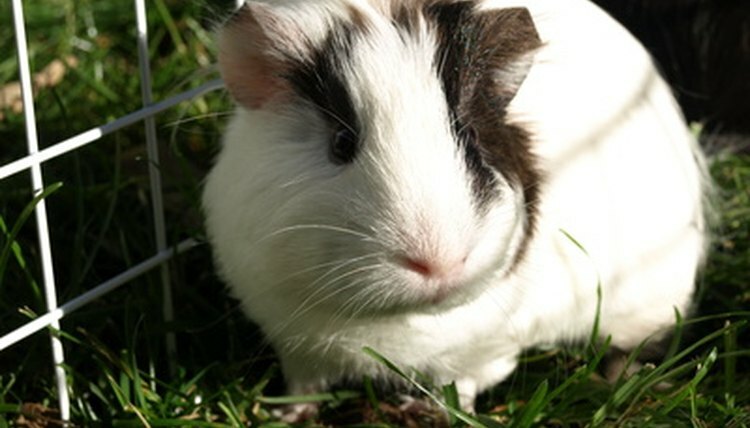 In fact, guinea pigs prefer to keep it clean. If you're cleaning out the cage and bathing your guinea pig as often as you should, odor shouldn't be a problem. Scoop out the cage every single day. Guinea pigs are fastidiously clean creatures that love to groom themselves and stay tidy, but if pet waste builds up inside the cage, it's going to smell -- and get in his fur. Every day, scoop out any damp cage lining and throw it away. Scrub out the cage once a week. Even with daily scooping, smells can build up in the cage, and you have to clean it thoroughly. Transfer your guinea pig to another cage or allow him to run around an enclosed space on the floor while you dump his everyday cage out. Scrub out the bottom of the cage with warm water and a mild detergent, then dry it out completely with a towel. Refill it with fresh lining and return your little buddy to his fresh, clean home. Give your guinea pig a bath every six months or whenever he smells like he needs it. Fill your sink with 2 to 3 inches of warm water and line the bottom with a wash cloth so he has some traction for standing. Gently massage some baby shampoo or guinea pig shampoo from the pet store into his fur, then rinse him completely. Towel dry him off before returning him to his cage. Brush out his fur once a day or so to remove dead hairs and prevent matting, which can build up and collect odors.  If your guinea pig has a chronic unpleasant odor, take him to a vet -- sometimes odors like this can indicate health problems.